Everything starts with the right name, whether you’re a new parent or the creator of an exciting new product. We all know this – it’s as obvious as, well, the moniker on your passport. So why do so many companies fail to prioritise getting the name absolutely right? Authenticity and integrity are a vital part of any brand campaign. It doesn’t matter whether the product comes first or the name, they must become inseparable for the marketing campaign to succeed as it should, and for the public to respond in the right way. One thing trumps even big brands and big bucks, and that’s a genuine passion. You’ve got to have it, and you’ve got to demonstrate it. Companies that say “We’ll just do a gin,” or “We’ll just do a face cream”, because that’s what’s selling well at present” – forget it, the consumer will sense the lack of conviction, and with so much competition, why would anyone spend money on a product that even the creator doesn’t believe in? If two years down the line, if there’s no real backstory – no influences or substance to communicate – it is implausible to suddenly just dream one up. Even a multinational can have true passion – and even a lone entrepreneur can lack it. Big brands win, first and foremost, because they are trustworthy – people know what they are going to get. So when launching a new brand from scratch, a strong foundation is everything. It’s essential to tell the consumer who you are, and to give them confidence in your integrity. A lot of the time, that comes down to the founder, but every single time, it comes down to the name. However, there’s no point finding the best, most appropriate moniker, and designing the perfect packaging to go with it, unless you own the rights to that name. It sounds obvious, but a lot of the best names are owned, and it’s vital to make sure of yours – particularly if you want your brand to expand internationally. Someone may own your name in the UK; someone else may own it in a market that will become important to you when you expand, like the US. Fail to tie up the international rights at the beginning and you risk having to change your name if you can’t secure those rights later on – with the consequent confusion and brand dilution that can be the difference between make and break. When the Bedford Lodge Hotel & Spa wanted to create a premium-quality gin, owner Mike Kean recognised that he needed branding skill to match his hotelier’s expertise, and brought us in right at the start. He wanted a gin that reflected Bedford Lodge’s values ­– quality, luxury, top-notch hospitality and the passion for horseracing – and would meet the high standards of his clientele. However we saw a bigger opportunity beyond The Bedford Lodge. The hotel, an 18th-century former stables, is situated in Newmarket, with its incredible reputation and history for horseracing. It is on Bury Road, where horses worth millions pass by to exercise each day. So, our first priority was to see if we could secure the name to The Newmarket Gin. And we did, in doing so creating a much bigger story and opportunity. The buy-in from the racecourse was incredible. In fact, everyone was hugely supportive. The Jockey Club allowed us go through their amazing archive for an image to use on the bottle, which we designed to convey that essential sense of fluidity and movement that horseracing immediately brings to mind. Local Master Distiller Dr John Waters, of the English Spirit Distillery, came up with the recipe for our gin. 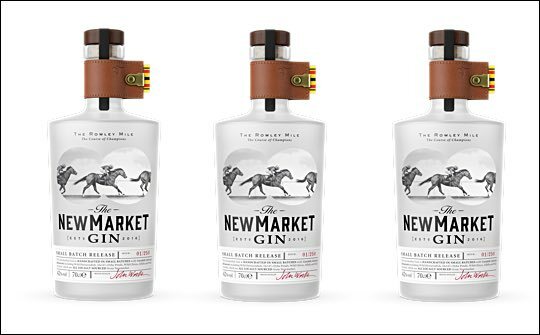 Newmarket saddlemaker Gibson handmade the leather collar on the bottles, and with the Jockey Club’s help, we were able to get the gin into the hands of key influencers, from the press to the jockeys themselves. We were even able to get permission to gift bottle number 90 to the Queen in her birthday year. The gin is fabulous – but without all that early preparation, securing the right name and forging the right connections, its amazing story would not have reached the world. It would have been just another artisan gin, struggling to stand out. Synergy was everything. Mike is an expert in his field – but he is not an expert in building brands and he knew it. We were there from the outset, registering the name, creating the identity and packaging, ensuring that the compelling story was going to reach the public in just the right way. The result is an award-winning packaging design, less than a year after launch. Get the name right, and the message will fall into place. Get the message right, and other elements will become obvious. Synergy can only strengthen a brand. The Glenlivet Alpha is a mysterious and rare single malt from The Glenlivet, released with no details about the cask, tasting notes or age statement. The name gives nothing away about the whisky, and it’s presented in a striking black bottle, the opaque colour preserving the mystery until the liquid is poured. Never underestimate the power of packaging. Get it all right and neglect your packaging, and you’ll regret it. After the name, that’s your direct connection between product and customer – the way to transmit your message, and you have 10 seconds to do it before the buyer moves on to something else. Packaging should create desire and a relationship with the consumer. You have seconds to grab their attention – but these are products that will sit on bar shelves or in cocktail cabinets for a long time. You’ll never convince anyone that the contents are precious if the packaging doesn’t reflect that. You want your clientele to warm to the packaging instantly, to understand the story – and to want to keep that packaging in view until the contents run out. Packaging has always been important, but in these days of Instagram and Facebook, it’s only getting more so. People are hungry for new experiences, for novelties to talk about, photograph, share. Consumers need to like your product’s look enough to share it on social media, or you will lose out on an all-powerful marketing medium. Lastly, never forget about the contents. A great name and packaging will compel people to try your product once, and share it on their social channels. But they need to love what they buy. If the product disappoints, there’ll be no second chance. That’s why the USP that makes your product great should be the driver behind the name and the packaging. If the product is great, the name fits and the packaging communicates not just how it’s great but why, then you are truly talking to the consumer – and you can be sure that they will reply.